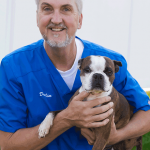 Dr. Ann earned her Doctor of Veterinary Medicine from Iowa State University in 1983 and became certified in Veterinary Acupuncture at the Chi Institute in Reddick, Florida, in 2008. 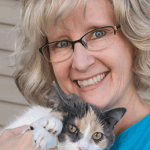 Dr Ann was named Veterinarian of the Year by the Nebraska Veterinary Medical Association in 2013. Dr. Ann was the first female president of the Nebraska Veterinary Medical Association. She served on the Continuing Education Committee for many years chairing it twice and on the Board of Directors for many years. She has also served on Veterinary School Admissions Boards for Kansas State University and twice for the Two Plus Two Program with Iowa State University. Her professional interests include veterinary acupuncture and small animal and exotic animal medicine and surgery. Her personal interests include gardening, dancing, and art, and she is a member of Peace Lutheran Church where played in the Hand Bell Choir for many years, also served as “Joyful Sound” Children’s Choir Director and was a long-time member of the Stewardship Board. She also served on the board of the Columbus YMCA. She has also served as a Youth for Christ Mentor. She and her husband have two sons, William and Daniel and enjoy the company of their many pets, furry and feathered.